Teacher Ryan Kelly belongs to a union where every member earns a living wage. But the women who run the cafeteria at the Whitby high school where Kelly taught math and computer science last year make just $11.50 an hour, nowhere near enough to have a decent quality of life, he says. Kelly wants that to change. He wants the Durham District School Board to become a living wage employer and ensure everyone working in area schools — including contract employees like cafeteria staff — earns a living wage. Establishing living wages holds the promise to transform the lives of so many in our province; providing a decent quality of life with opportunities to fully participate in our society through recreation, culture, and entertainment. If we implement a fair minimum wage in Ontario the very fabric of our society would be transformed for the better. Of course many will argue their budgets simply won't allow for this practice to be implemented. We understand the challenges to make ends meet. But such challenges do not absolve us of our responsibility and we must be steadfast in moving toward the vision of a society where all have enough. Read the full Hamilton Spectator op-ed here. 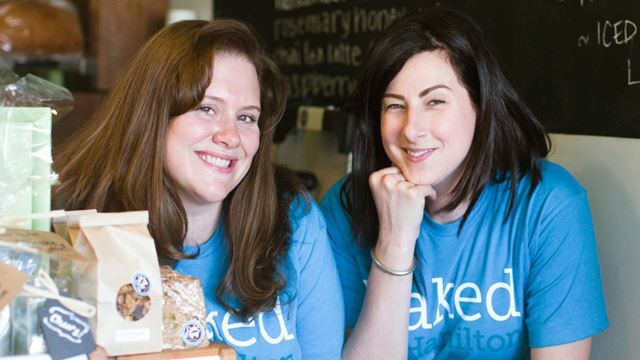 Employees share what earning a living wage means in their lives. 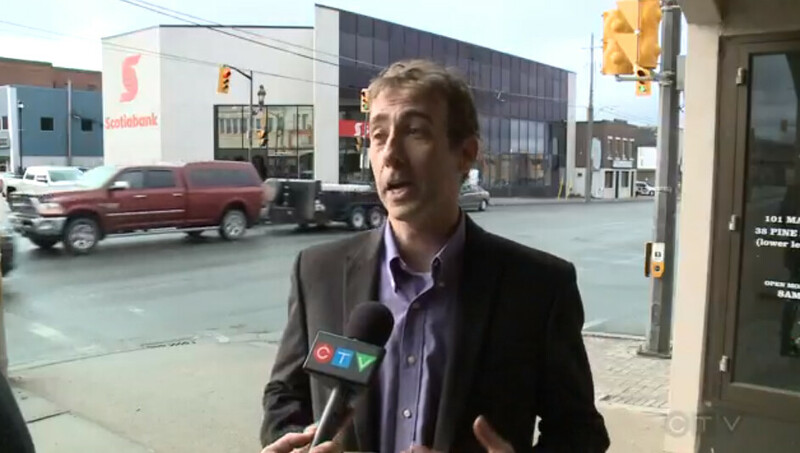 Click on image to watch video at CTV Northern Ontario. During an announcement at the Hamilton-Wentworth District School Board’s office on the mountain, the Living Wage Working Group unveiled the updated calculation at $15.85 per hour more than Ontario’s current minimum wage of $11.40 per hour. 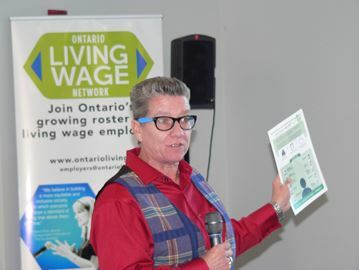 More than 100 employers in Ontario have adopted a living wage policy to assist the province’s 1.8 million working poor. 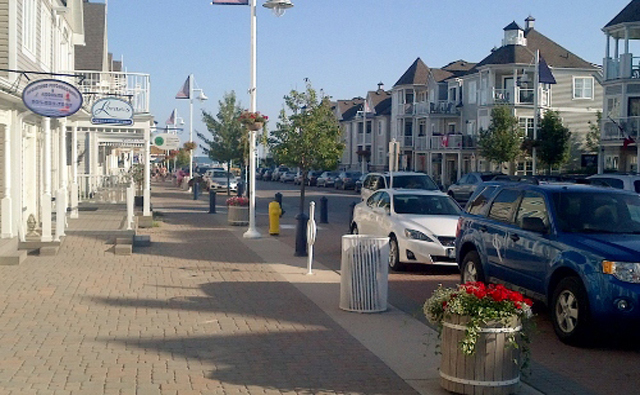 Hamilton’s revised living wage is on the lower scale of what 14 other Ontario municipalities have adopted over the years such as the Niagara Region at $17.47, Peterborough with $17.65, Toronto with $18.52 – the highest – and Halton Region at $17.05. There are nearly 30,000 adults in Hamilton working full or part-time jobs but don’t earn enough to pay their bills each month, says Deirdre Pike, a social planner at the Social Planning and Research Council. Members of Living Wage Kingston and the Ontario Living Wage Network came together at Sisters of Providence of St. Vincent de Paul on Wednesday, Nov. 2 to announce the updated living wage calculation for Kingston as part of Living Wage Week. 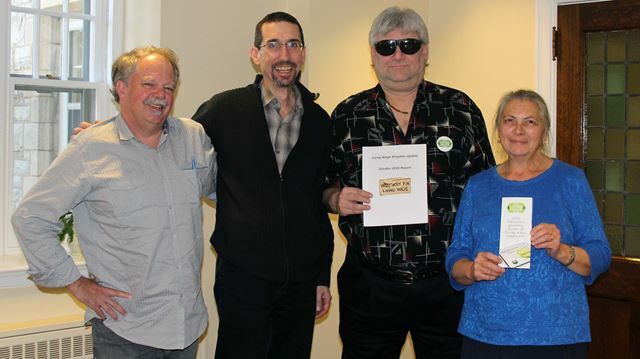 (LtoR) Jamie Swift, volunteer member of Living Wage Kingston, Greg deGroot-Maggetti, co-chair of the Ontario Living Wage Network, Cam Jay and Tara Kainer, co-chairs of Living Wage Kingston.